Using SQL Injection Vulnerabilities to Dump Your Database – Java, SQL and jOOQ. Thanks for the additional ideas. These are all very good additional counteractions! hi, May I known your advice for my problem? I am studying master thesis about detection of SQL injection attack types in database driven web application. So, is it easy to detect SQL injection attack types in web application? And, is it easy to create injecting malicious SQL command into SQL statement to steal sensitive data in database via web page? Should do I will continue as a thesis project?Please,advice me,thanks. So, is it easy to detect SQL injection attack types in web application? 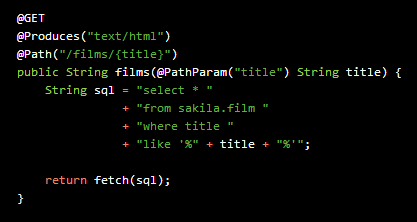 And, is it easy to create injecting malicious SQL command into SQL statement to steal sensitive data in database via web page? Should do I will continue as a thesis project? Sure. This topic deserves much much more attention!